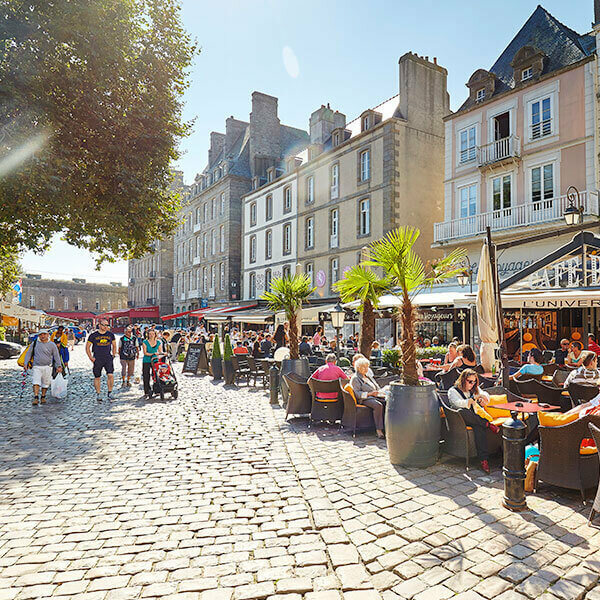 Day trips to St Malo with Condor Ferries - what happens? Isn’t it time to discover this beautiful walled city with its fascinating maritime history? You'll find mouthwatering delights, friendly people, fine restaurants and breathtaking history along its ancient cobbled streets, on a real day trip to remember. Sail with us on our high-speed ship, Condor Rapide. You’ll have up to six hours ashore to embrace this city, famous for its independent spirit. It’s full to the brim with fascinating seafaring history and culture, with its numerous statues and galleries, quaint cafés, street musicians and markets. The stained glass windows and tombs of local heroes make the Cathedral a must-see before you head back. If you’re interested in Gothic and Romanesque architecture, then this impressive example is a rare treat, attracting visitors of all ages and interests. Standing proudly in the centre of the city, it was once the seat of the Bishop of St Malo. This imposing fortress stands sentinel above a maze of subterranean walkways and chambers. 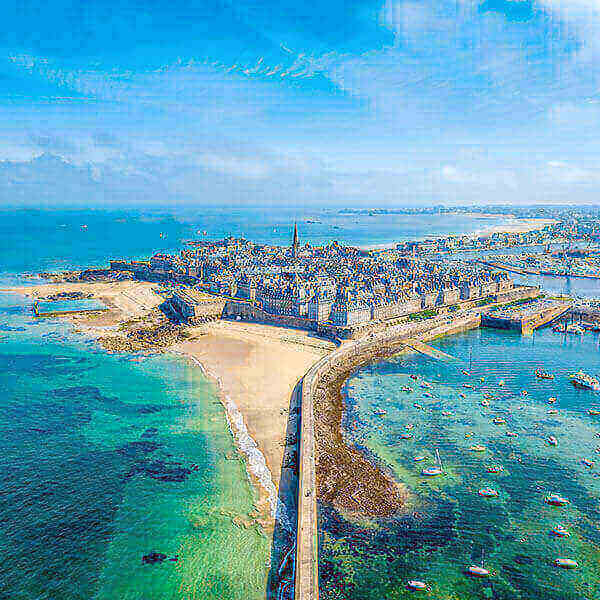 You’ll be able to tread its ancient ramparts and see St Malo from a new perspective. Getting out to this rocky islet involves a well-timed walk at low tide. The tides move quickly and you could find yourself stranded for six hours, so choose your moment carefully! Telling the story of St Malo under German occupation during WWII. Guided tours are available through the day, and you’ll have the chance to see restored German bunkers. An expansive seawater pool – Piscine de Bon - dominates this popular, large beach. The pool is perfect for high tide swims and there’s also a nearby yacht club for sailing fans. Although a relatively small beach, Plage du Mole is hugely popular during spring and summer months. It’s the most southerly of St Malo’s beaches and offers plenty of shelter along with wonderful scenery. From classic French fayre to sumptuous seafood, you’ll find fantastic food to suit every budget. Madeleine Shopping Centre is one of the best shopping centres in the Côte d’Emeraude. Come close to a whole manner of marine life, from crabs to piranhas, to barracuda, rays and sharks. You can even enjoy a breath-taking walk through the underwater viewing tunnel. The city’s streets are flanked by characterful homes, unique boutique shops, charming cafes, restaurants and bars. Whatever time of day you’re travelling, there’s no better way to start your trip than with a tasty meal or snack and a refreshing drink. You’ll find something to suit all tastes on our ships, including children’s, vegetarian and gluten-free options. For an additional cost, you can choose to upgrade to either Ocean Plus, with stunning panoramic views overlooking the British Isles, or Ocean Club, a steward service with complimentary tea and coffee throughout your journey. We are the only ferry company to offer genuine duty free savings onboard. You’ll find big savings on your favourite brands – wine, spirits, fragrances, beauty products, watches, gadgets and gifts, with many travel-exclusive products that you won’t find on the high street. Bus - Hop on the number 10 bus from the city centre to visit the Grand Aquarium. It only takes 10 minutes and costs just 2€. Train - Take Le Petit Train from Esplanade Saint Vincent and have a tour of the City in 30 minutes. Walking - Stroll along the bay and while you’re there, visit the pretty islands of Grand Bé and Petit Bé that can be visited on foot at low tide.